Do we need an Antivirus app on our Android smartphone? Is Android not secure? Is it vulnerable to attacks as we see in Windows Operating system? Unfortunately, answers to all the above questions are Yes. No doubt, Android is the best mobile operating system when it comes to customization and features and it has widely become the most-used operating system. Being a popular open-source platform, it has become vulnerable to threats like malware and adware attacks. There are times when you visit a website (unsecured) that prompts you to download an app after showing a fake warning about security risks on your phone. Don't give heed to such on-screen notification that prompts you to install any 3rd party app. There are also instances of Android users comes under adware attacks by malicious apps installed from Google Play Store. Time to time Google take action to remove such apps from play store but each and every day these malicious apps are added to the store. So whatever app or software you use, having an Antivirus app is essential for the security of your Android device. 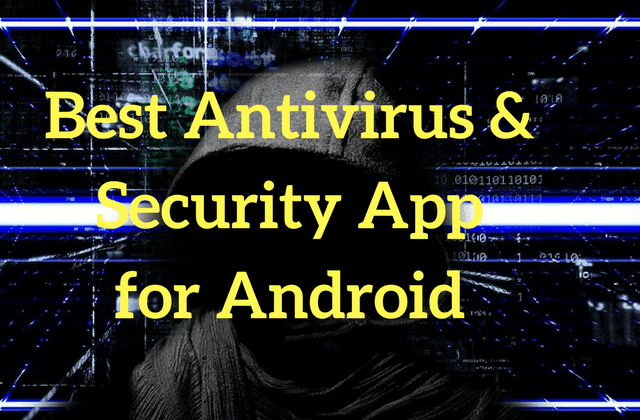 In this article, I have highlighted a list of 7 Best Security or Antivirus app for Android Mobile in 2018. All these apps are some of the big brands in online security. Note: We have planned this list by analyzing the data from AV-TEST, an independent organization for testing Antivirus applications. When it comes to security, AVAST is the biggest brand we have and they are on Android too guarding over 400 million devices globally. Avast Mobile Security app protects you against viruses and malware such as unwanted popups and adware. It will alert your device when you install a spyware and adware apps. Its free version includes call blocker, firewall, web shield, photo vault which secure your private photo with a PIN, and Anti-theft that wipes your phone if it goes missing. It also protects your device against phishing attacks from email, phone calls, and unsecured websites. 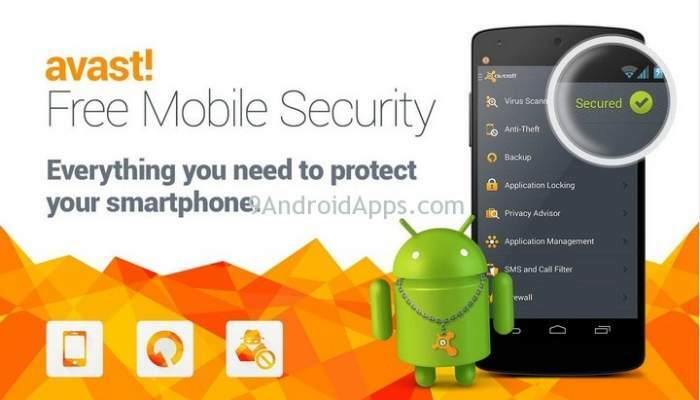 AVAST Mobile Security is the world's most trusted Antivirus for Android with most of its features are free. 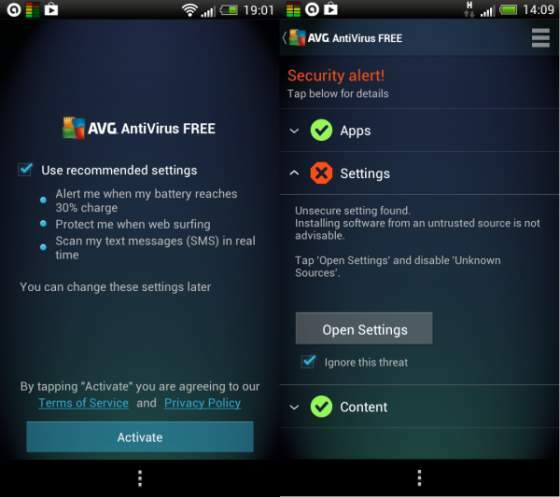 AVG Antivirus provides effective malware and virus protection for free. It scans installed apps, games, and websites and removes malicious content. It also keeps your personal data safe with features such as App lock, Photo Vault, call blocker, and app permission advisor. Some advanced useful features are only available in Premium version, however, you can try them for 14-day free trial. Premium features include taking a selfie of a person and send it you via e-mail when 3 unsuccessful attempts are made to unlock your device. It even locks the phone whenever a SIM card is replaced. Note: This app requires Device Admin permission to remotely lock and wipe your phone from avg.com. 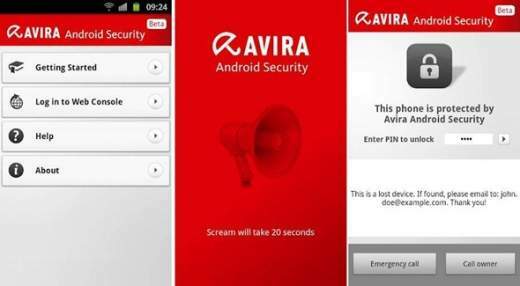 Avira Antivirus is an award-winning antivirus and privacy tool for Android developed by AVIRA. It is one of the best anti-theft apps for Android that allows you to track and find your lost or stolen smartphone. It not only scans your apps and files but it also scans content on your phone's external storage. It even rates apps on a privacy scale that tells how much information it collects from you and if it is trustworthy. It blocks apps that try to take unauthorized access. Avira Antivirus Security protects your data from ransomware attacks that encrypts your data and take your device hostage. In the era of leaks and constant data threats, Avira antivirus ensures your phone's photos, contact, credit card details, emails, and other personal data stays secure. 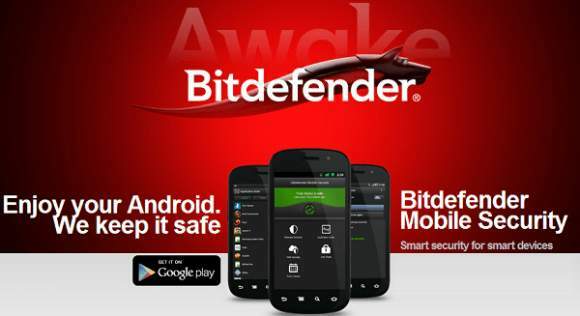 Bitdefender Mobile Security is the most powerful cybersecurity app for Android that gives you absolute real-time protection against viruses and malware. With the latest update, it added a VPN service that lets you surf the web using a virtual location by hiding your current location. Most of its features are available only when you get a premium version however you can still enjoy them on a 14-day free trial. It automatically scans installed apps for viruses and if a threat is found, it will take you to a result page where you can easily delete the corrupted ones.With this app, you can protect account privacy, use smart unlock, web security, Anti-theft phone locater, and malware scanner. Kaspersky is one of the best Antivirus apps for Android that protect your private information from online dangers. Some of its features are - background check for viruses and trojans, app lock, Anti-Theft, Anti-Phishing, Call blocker, Web filter, Find my phone, etc. Some of these functions are available in Premium version. It offers cloud-based scanning, real-time protection, app lock, voice control to use 'Find my phone' feature. 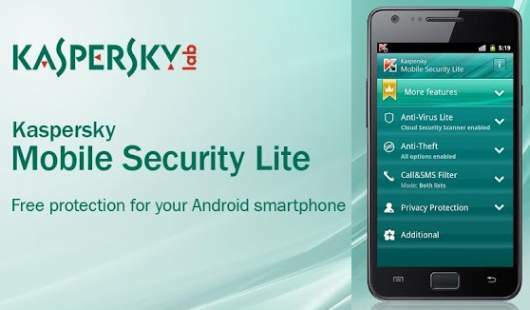 Even when you are accessing other apps or playing games on your phone, Kaspersky Antivirus performs a background check and if it detects any infections, its virus cleaner will block dangerous apps and files. Norton is a big name in online security that detects 100 % of the malware threats in Android. Like other Antivirus apps, it also has free and Premium versions. All the basic features like malware & virus scanner and remover, trigger a "scream" siren to find your lost phone, remotely lock your phone when the SIM card is replaced, automatically locks the device after successive failed attempts. 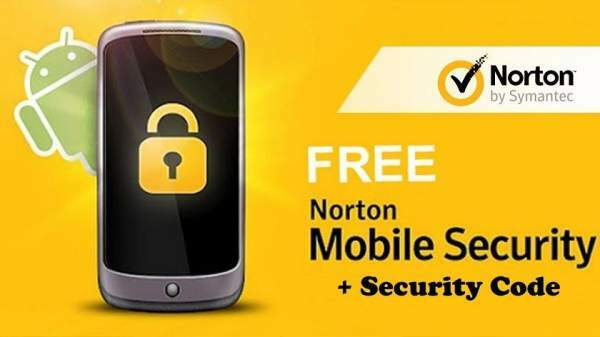 Norton Antivirus automatically saves the location when the battery is low, syncs contacts and messages, block unwanted call and messages, and prevent access to unsecured apps and games. You can buy the premium versions for $39.99 with a one-month free trial. 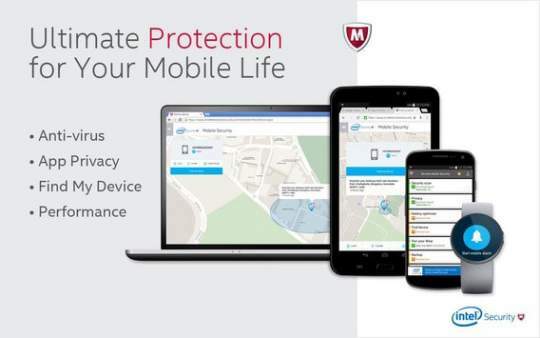 With Premium version, you can protect multiple devices at your home. It offers real-time protection from threats, prevent unsecured websites accessing your personal information. It is the last in the list but not the least by any means. McAfee is a free antivirus that protects your phone from virus and enhances the performance. Its free features include Anti-Theft, Anti-Spyware, Virus Removal, Performance Optimization, Backup, Lost Phone finder, etc. When someone steals your phone, it takes the snap of the person holding it. You can also free up RAM usage by clearing background apps, optimizes battery for best performance, and remove junk files. Which one is your favorite out of these 7 free Antivirus apps for Android phones? If you have any suggestions to make, please mention them in the comments.